1920's Four Square Renovation, Gut-Rehab, Village of Wilmette. Considered a truly American style, the massive and conservative detailing of the Foursquare (1895-1929) was an economical housing type suited to lots restricted in width, prefabricated lumber sizes and the housing boom of the 1920’s. Perfect for Wilmette. Easily recognizable by their boxy shape, steep hipped or gabled roofs, wide porches (normally), and simplified motifs foursquares were a refreshing change from the Victorian era. 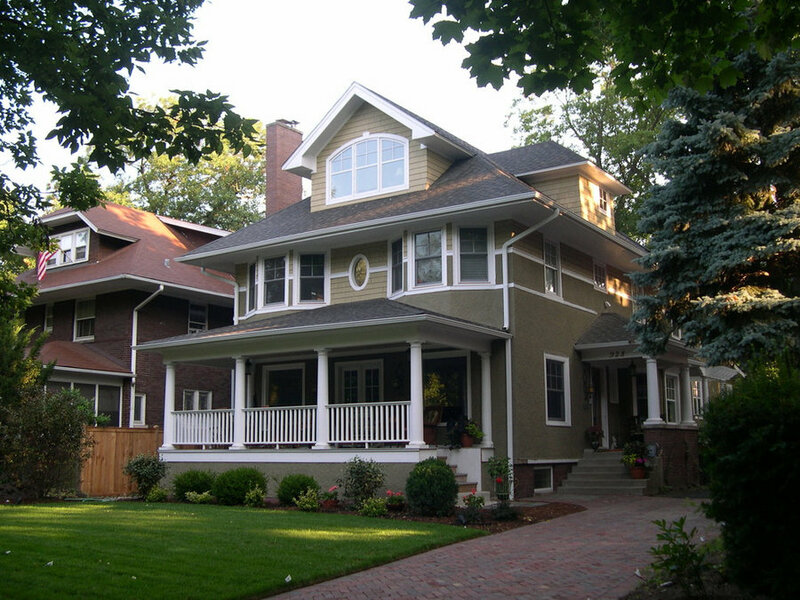 This project is stylistically called a Free-Classic Colonial Revival Foursquare. The attics Palladian-style window and small centered 2nd story window is typical of this variant. Once you step inside all the usual foursquare component, such as built-in bookcases, benches, window seats, machine-printed wallpaper, and emphasized hearth and mantel are present. Wilmette has many, many foursquares and they are usually the easiest of the housing types to design additions for as their square floor plans can easily accommodate open concept floor plans and additions to the rear.